When I think of summer, I think of fresh cucumbers and tomatoes. A previous post features one of my very favorite salads for this season. Basil occupies a prominent place in my herb garden this summer and I’m always looking for ways to use it. For this post, I decided to make a batch of pesto and pair it with shrimp salad. The recipe will make more pesto than you need for this dish, but it freezes very well. When making pesto, I typically double the recipe, divide it into serving sizes, place in food storage bags, and freeze it. When freezing pesto, you’ll want to omit the Parmesan cheese and add it when it’s thawed and you’re ready to use it. In order to get even cucumber slices for this recipe, it is almost imperative to use a mandolin. If you don’t own one, I would highly recommend making the investment. There are many different varieties, but mine is a plastic one that cost under $20. Many models will julienne as well as slice. 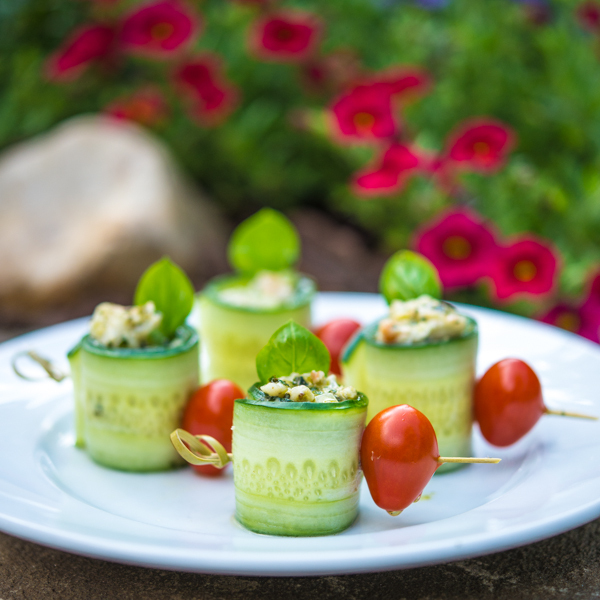 These cucumber rolls make a great appetizer before a summer dinner or you can serve several of them on a bed of lettuce for a light lunch. 1. Combine basil, garlic, walnuts, salt, pepper, lemon juice, and lemon zest in the bowl of a food processor. Process until finely chopped. 2. While processing, slowly add olive oil until well blended. 3. Transfer pesto to a bowl and add Parmesan cheese. Stir until blended. Set aside. 1. Combine shrimp, celery, and onion. 2. Stir mayonnaise and pesto together until blended. Add to shrimp mixture and mix well. Set aside. 1. With a mandonlin, thinly slice cucumbers lengthwise. 2. Place a heaping teaspoon of shrimp salad on one end of a strip of cucumber. Roll end of cucumber over salad and continue rolling tightly. Secure roll with a toothpick and garnish by attaching a grape tomato to toothpick. What a beautiful presentation! I want these at my next party. Really nice presentation! I’ve made cucumber rolls like this before, and they always look so great. Love the idea of adding the grape tomato! Thanks, John. The tomatoes were an afterthought, but I liked the way they looked. What a great summer recipe! Love everything about it, especially the addition of the lemon and zest in the pesto. I could make a meal out this! That is one of the prettiest plates of food I’ve seen! So simple but so stunning. Thank you, Caroline! I appreciate you dropping by! Thanks, Monica! I appreciate the compliment! Thanks for visiting my blog.